I found one old interesting recording from my archives. This is from previous solar-maximum period over 10 years ago, from 30.12.1997. 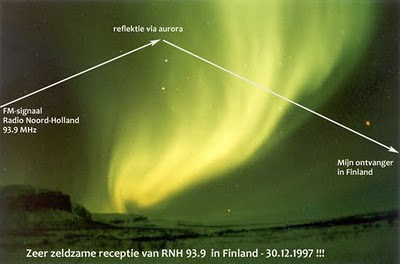 I heard Radio Noord-Holland (RNH) from Wieringermeer-tx on 93.9 MHz (11.2 kW) via auroras in the Northern sky! Aurora-reflection gives usually very distorted audio and it is difficult to copy the words. However, this time audio is clear enough to understand station-id. It's a promotional jingle about the upcomming program on newyears-eve. 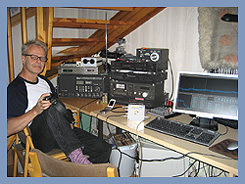 Voice is probably of Ron Bakker, a technical engineer who lso is 'the voice' of Radio (and now also, television) Noord- Holland. Next solar-maximum is coming within next 3-4 years. 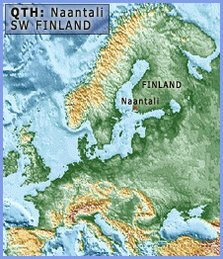 Via auroras I have heard usually Scandinavian, Polish and German high-power transmitters. Sometimes also BBC and Russian. Mostly signals are too distorted, because auroras are moving all the time, but sometimes surprisingly clear, mostly with the highest tx-powers. My record with aurora-reflection are two Norwegian low-power stations from Oslo, Topp Radio 106.8 MHz and Radio Nova 107.7 MHz, from 1989-1990 period. Tx-powers on both is only 100 Watt (both also QSL'ed). 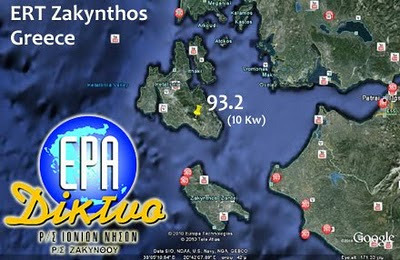 This propagation is not interesting anymore because completly free frequency is needed and mostly the same stations are up. RNH and Norwegians were nice exceptions.